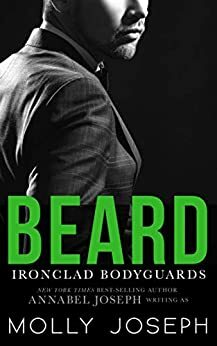 Beard by Annabel Joseph, writing as Molly Joseph, is AVAILABLE NOW! Jenna entered a fake marriage ten years ago when she was young and reckless, in hopes it might advance her failing Hollywood career. Ten years later, she can’t undo her mistake. Her A-list husband is too famous—and too cowardly—to admit he’s in a long-time gay relationship with a fellow actor, and at thirty-four, Jenna’s dreams have faded to dust. Then Caleb Winchell enters her life. The taciturn, Texas-bred bodyguard is as handsome as he is capable, and Jenna’s lonely world is rocked. He’s a true and honest force in her dishonest existence, standing by her side as she fake smiles her way through the smothering farce of her life. Caleb helps her breathe again, but she can’t act on her deepening feelings toward her bodyguard. He’s a professional, and he never breaks the rules.